Two energetic young video podcasters from the U.K. filled in the gaps when Apple didn’t provide a live video stream of its WWDC keynote today, where it debuted updated software for Mac and iOS and a new cloud storage service. 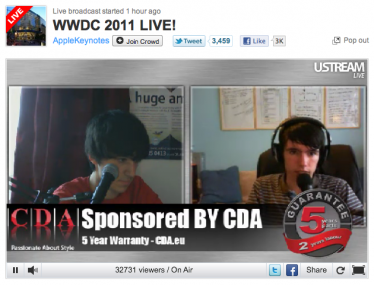 Broadcasting on Ustream under the channel “AppleLiveKeynotes,” John Coles and Joe de Max served as keynote DJs, switching between blurry video feeds that were often shut down mid-stream, audio feeds, and even desktop screencasts of the Engadget liveblog when they had to. Coles and de Max interjected their own comments–mostly oohs and ahs–with ongoing we’re-all-fanboys-in-this-together repartee with their commenters (a.k.a. “Don’t tell me to hurry up!”). The two hosts even somehow had time to answer questions from AllThingsD while the keynote was still running. The channel had more than 30,000 simultaneous viewers for most of the keynote (which has currently been going for more than an hour and a half). AllThingsD: Where did you get the idea to do this, and have you done it before? John Coles: This was an idea that me and Joe (my co-host) had a few years ago and did separately. Now we work together to get the video feeds and audio feeds. The first time I did this was covering the iOS 4 announcement which received a 20,000 peak in viewers. How did you promote your Ustream page? The Ustream is a featured channel so when we go live on this channel it is auto-featured on the Tech page of Ustream but we usually start streaming a countdown around 5 hours before to allow viewers to know that we are going live. Where are you finding feeds? I would love to tell you but that is a trade secret. :) That is what helps us do what we do. Most of the time the chat room and the Twittersphere come in very handy so I guess you would call it crowd sourcing. What are you using to patrol Twitter so quickly? I use an iOS app called Boxcar (http://boxcar.io I believe). This sends me push notifications for new followers and @mentions. Other than that I just have the web client open on my MacBook. Do you know what your peak viewership has been? I saw it at around 40,000 but we will know tomorrow when Ustream releases the figures to us. Has anyone tried to shut your feed down that you know of? Not that we know of but last time we did it we did crash Ustream. They stayed down for around 10 minutes. This year they managed to keep up with us. We did have to cut the quality though; originally we were sending them a 700 Kb/s stream, now we are sending them around 500 Kb/s. Both me and Joe are sure that Apple are watching us very closely though. Does your podcast have a name? Or should I refer to you by your day jobs? We don’t really have a day job but our new site is going to be http://techreboot.com/.